« Lots Of Fishing Going On!…and Catching! Pretty much the same pattern on generation. If they are going to run water, it has been in the morning then off the balance of the day. We had one units on for three hours yesterday morning. Kind of messed up fishing while the units were on and for a little while after they turned them off, but after that, it was “fish on”. Monday, Carolyn took Paul and his two sons, Joseph (11) and Jacob (13) out for half a day. Of course, this was the coldest day of the week. We stayed out for a couple hours and they caught fish on the black copperhead midge, but we soon decided they were not having a good time. Let’s roll them in and try again later in the week when it warms up….unanimous! To the bank we went, loaded up and back to the shop. Wednesday, and yes, Gina and Wednesday Jim were on the water. Still a little cool on Wednesday, so they made it a noon start to let it warm up a little. They had a good day on the ruby 2 midge and a red soft hackle. Lots of fun despite lots of LDRs (long distant releases). Walt, from Texas, spent the afternoon on the water with Stan. Good day for them too, but on the black copperhead in the early part of the afternoon then the copper dun midge the balance of the afternoon. Carolyn took John and his son Anthony out on Thursday. Started out a little slow for us up near the Hatchery so we did not stay around there too long. Move on downstream and hooked several on the black copperhead midge. Worked the narrows below the boat ramp with the tiger tail and ruby 2 midge. Finished off the afternoon with a bang. Stan had Tim and Stephan out for a late a.m. start. Great day for them on the ruby 2 midge. Friday it was Paul and his two sons again. This time on a warm day. 70s….yeah! We went straight to the narrows as I wanted to let Paul some streamer work with the sinking leader and tiger tail. Got him off to a good start with this set up. Meanwhile, Jacob and Joseph were wearing me out with “fish on”. Very good day for both of them on the ruby 2. Stan took Matt and his son, Matthew out for the day Saturday. Very good day for these guys on the ruby 2 midge. Unfortunately, Matt lost the bet on most fish. New sunglasses for Matthew or yardwork for Matt for a year. Matthew is now wearing new sunglasses. Tony from Kansas wanted to work on technique and was especially interested in drift boat fishing as he is getting ready to build a drift boat. We had a good day on the black copperhead midge early, then the ruby 2 midge and stripping a tiger tail. 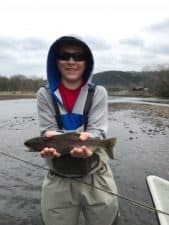 This was Tony’s first time to catch a trout on a fly rod. Think he was hooked before but this finished him off. Jarrod and his father Wayne spend the day on the water with Jim. Very good day for them mainly on the hot Hare’s ear nymph. Overall, we are hearing from fisher all up and down the river having very good days on the water. I talked to one of our customers who was fishing down past Fall Creek and he was catching on the ruby 2 midge. 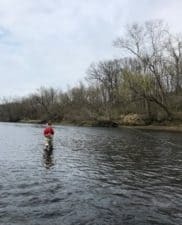 This entry was posted on Sunday, March 19th, 2017 at 4:57 pm	and is filed under Fishing Reports. You can follow any responses to this entry through the RSS 2.0 feed. You can leave a response, or trackback from your own site.